Nights on Christmas Island in the Indian Ocean will never again be the same. The last echolocation call of a tiny bat native to the island, the Christmas Island pipistrelle (Pipistrellus murrayi), was recorded on August 26th 2009, and since then there has been only silence. Perhaps even more alarming is that nothing was done to save the species. According to a new paper inConservation Letters the bat was lost to extinction while Australian government officials equivocated and delayed action even though they were warned repeatedly that the situation was dire. The Christmas Island pipistrelle is the first mammal to be confirmed extinct in Australia in 50 years. "It is estimated that a single pipistrelle consumes its body weight in insects per night," Tara Martin lead author with Australia's national science agency, Commonwealth Scientific and Industrial Research Organisation (CSIRO), told mongabay.com. "While the loss of the pipistrelle is likely to lead to more insects, it is too early to tell what the long term ecological impact of this will be on the island." In January 2009 an expedition found only four individuals in a single roost. Bat expert, Lindy Lumsden, at the time warned the Australian government that the population could be as low as 20 bats and "if the current rate of decline continues, this species is likely to be extinct within the next 6 months." Lumsden added, "It is critical therefore that a captive breeding program is established immediately as insurance against further decline in numbers and as a source of individuals to reestablish wild populations once the cause of decline has been identified and controlled." "It is quite possible that this is one of the few times that an extinction of species in the wild can be marked to the day," the entry on the bat for the International Union for the Conservation of Nature (IUCN) notes. While it is possible a colony of bats remains, it's unlikely giving the extensive surveying by researchers. Scientists still don't know what pushed the bat to extinction, although there are a number of possibilities, including a slew of invasive species such as feral cats, common wolf snake, and a recent invasion of yellow crazy ants. Disease is another possibility, though researchers could find no sign of the bats suffering from illness. So, what went wrong? According to the paper inConservation Lettersa lack of leadership doomed the species. "Leadership has been found to be a key element in the recovery of many endangered species around the world. Without a 'champion' to maintain the pressure on governments to act, species will continue to fall through the cracks," explains Martin, who notes that the leader doesn't have to be an individual but could be an organization or government team. "However no such decision was apparent," Martin say. Instead officials delayed making any decision whatsoever until eight months after warnings. In the end "a lack of brave decision making in the face of uncertainty, and a lack of accountability for stalling decisions contributed to the loss of the pipistrelle," says Martin. "Monitoring [of endangered species] must be linked to decisions, institutions must be accountable for these decisions and decisions to act must be made before critical opportunities, and species, are lost forever," Martin says. "Recovery teams are an integral part of species recovery success because they act as the 'champion' to ensure the decision process is carried through from the information gathering stage to the implementation of actions and monitoring of success," explains Martin. "As humans we inevitably place more value on some species than others. In the case of the orange-bellied Parrot, it has had a committed multi-agency, multi-government recovery team including members from universities and NGOs lobbying and working hard for its protection for nearly 30 years. No such recovery team or 'champion' existed for the pipistrelle," she says, adding that, "There is little doubt that if the pipistrelle had of resembled a panda, a captive program would have been established a long time ago." "The lessons learned here are relevant to the world. Stemming the loss of global biodiversity through recovery planning will require brave, effective governance, leadership and decision making in the face of uncertainty." 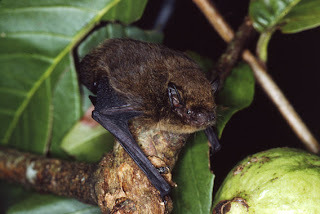 Unfortunately the Christmas Island pipistrelle is now added to an extensive list of mammal extinctions on the island, including Maclear's rat (Rattus maclean), the bulldog rat (Rattus nativitatis), and perhaps even the Christmas Island shrew (Crocidura trichura), which hasn't been recorded since the 1980s. With the loss of the Christmas Island pipistrelle, the last remaining endemic mammal may be the Christmas Island fruit bat (Pteropus melanotus natalis), a subspecies of a bat found on nearby islands including Sumatra.